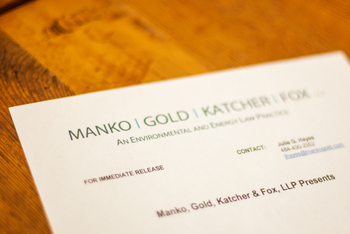 Brenda Hustis Gotanda, a partner with Manko, Gold, Katcher & Fox, LLP (MGKF), the environmental, energy and land use law and litigation firm based just outside of Philadelphia, PA, will participate in a panel discussion on "Sustainable Solutions" hosted by Villanova University as part of its 2015 Earth Day celebration. The panel will be held on April 23 at 10 a.m. in the Falvey Library Speakers’ Corner. The panelists will discuss challenges and opportunities of working daily to address environmental sustainability from a variety of viewpoints, including environmental law.